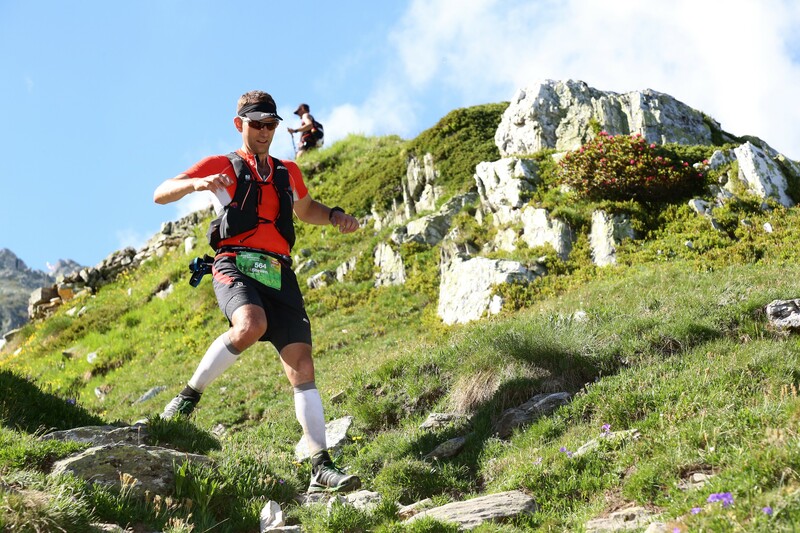 I put in a good winter and spring of training, culminating in the ‘Ultra Tour du Mole’ in May, confusingly not actually an ultra at 35km, but with a hefty 3200m of climbing this was the perfect tune up for what was to come in the summer. The Tour du Mole was tough- not least the constant steep up and down nature of the course, but also the fact that I sprained my ankle badly after just 5km. Perhaps foolishly, I finished the race, but the downhills were almost unbearable given the compensation I was having to make to keep weight off my right ankle. After the injury, there was a trip to the doc for some x-rays and 3 weeks of rest, trying to get some road cycling and a few light runs in, but finding the sprain constantly aggravated. It took a repeat visit to the doctor 4 weeks out from the TVSB to ask his frank advice- was running an ultra a realistic goal? He was confident that the sprain would heal, and that I should try and ramp up my training again- one easy week to build back up and then a full high mileage week three weeks out from the event. The ankle would feel stiff, but the loading would help the blood flow and healing to occur. I followed the advice, putting in a big 115km/7000m vertical training week with 3 weeks to go until the big one, and finally it felt like the ankle would hold up. Sleep on the Friday night was OK, and I felt surprisingly alert when the alarm went off at 3am, although forcing down some oats and putting on suncream (The forecast was superb: sunny, hot and dry) in the pitch black felt weird. My wife woke up as well so I took the chance to ask her to slap a load of bodyglide on my back. The start of an ultra was an interesting experience; I seemed to have timed it to perfection: drop bag duly dropped, portaloo visited and then just a five minute wait for the start. What followed was a rock concert build up- fanfares (put your hands is the air!) and a cheesy blast of the Final Countdown by Europe. After such grandeur, what followed was a hilarious slow shuffle across the line, with half the field not even breaking into a jog- we all knew what was to come. In spite of my British reluctance to whoop, it was a fitting start to an epic event. Off we set through the streets of Verbier, picking up speed on the tarmac, and then it was the warm-up climb above the town, before dropping down to Sembrancher as the sun rose. The valley cruise was lovely, what felt like free kilometres with all the climbing and descending to come. As it got light, I found myself on the lower slopes of La Catogne, a fearsome beast to start the race with (if you can call 1 hour 30 mins into a run the ‘start’): 2000 metres of vertical ascent into increasingly technical terrain. I felt good, pacing my heart rate to no more than 150bpm. The decision to wear a heart rate strap was taken to gain useful data, the cost was potential chafe, I put my faith into bodyglide to save me. A real highlight of the race occurred as I made the ridge, a Helicopter flew close alongside me for several minutes, causing a huge adrenaline surge to carry me towards the summit. Sadly there is no footage of me in the cool little clips the organisers have been pumping out, but they are still included here to help bring my worlds to life a bit. The descent was bonkers, a steep rocky gully with scree and loose material everywhere. It felt like dropping off a cliff. Eventually the terrain mellowed and I dropped into Champex for a short pit stop to empty debris out of the shoes, refill water and sample the soup. Mmm, salty. The next few kilometres out of Champex were stunning; streams and a path along the very Valasian ‘Bisse’- ancient canals that contour the hillsides. Sadly the contouring didn’t last long and we turned left up a steep footpath towards the Orny glacier way above us. This was another huge climb, on steep terrain that went from forest, to very blocky scree, to ice and snow. A quick bottle fill and a handful of raisins at the Cabane saw me turn and head back down, with the first kilometre running back through those still climbing- a fun exercise with poles waving everywhere and limited places to plant your feet. The steep downhill took us alongside many waterfalls under the imposing spire on the Clochers du Portalet, and with the Saleina Glacier beyond this it was worth looking up every now and again to take it all in, what magnificent terrain to race through. As I dropped to the valley, the heat became more and more oppressive, with clear skies and the middle of the day approaching. 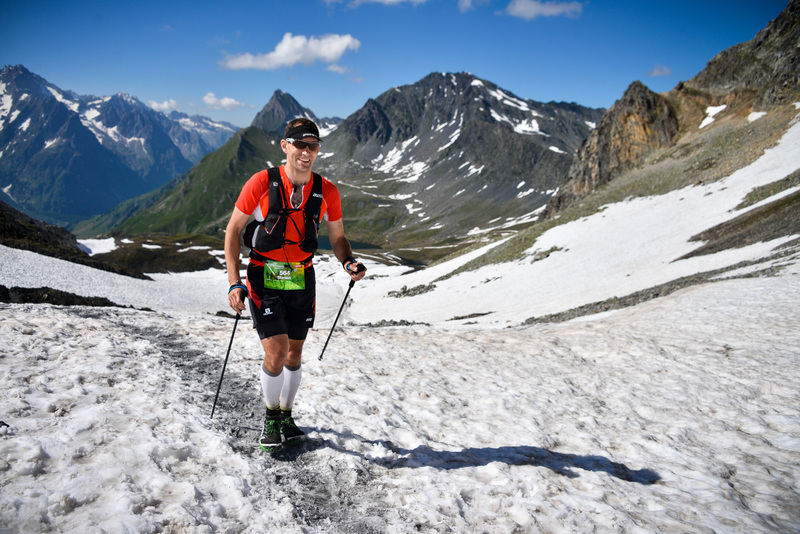 The cruise up to La Fouly was hot, but welcome after the two steep efforts behind us, and it was a real treat to see my family a few hundred metres before the aid station, although my daughter Charlotte soon turned and ran the other way when she got a whiff of me after 10 hours of running. After a short food and drink stop, it was off again, firstly an easy double track ascent followed by undulating footpaths, and then steeper trails up towards the Lacs de Fenetre, which when we reached them were still full of ice, with the corrie itself still covered in a thick layer of snow. I couldn’t seem to get my heart rate up anymore on the climbs, now topping out at 140bpm even though I felt like it was hard work. We passed briefly through Italy, climbing up the Grand St Bernard monastery for an aid stop, before heading up a lovely path to the Col des Chavaux and then a glorious downhill all the way to Bourg St Pierre. I was more on my own than before though this section, and I truly appreciated the calm and space to think. Throughout the race I tried to focus my thoughts on several positive things. Early on I decided to try and recall every run and bike ride I had ever done, in an effort to convince myself I had the endurance base necessary to survive! The one that kept coming to mind was when my brother and I attempted to walk/run from Rochester to Canterbury, along the North Downs Way in the South-East of the UK. I must have been about 14, him 16, and although we didn’t finish, stopping at around the 45km mark (I just measured it, happily the phone box we used to call mum for a rescue is still marked on the map!) it was an early lesson in the need to prepare better for endurance. Later in the race I thought more and more about my family, and how supportive they were of these ultimately pretty selfish ventures. Back in the real world, I noticed that I had ski toured in the bowl we descended into, giving me a certain familiarity with terrain and distance, so I opened up a bit although was occasionally stopped by river crossings, one of which was quite deep and fast flowing. Before this crossing I had thought I wouldn’t bother changing shoes in Bourg St-Pierre, afterwards my feet started to go pretty soggy, so entering the sports hall and finding my bag stashed with grub, dry socks and a fresh pair of trainers was most welcome. It was now just after 8pm, and I didn’t hang about too long at the aid station, taking just a small plate of pasta, and headed on into the evening up towards the Col de Mille. The first section was a long drag, but the reward was a contouring path heading towards the setting sun; seeing runners ahead silhouetted above the Dents du Midi I know so well from another angle was a special memory. The head torch soon went on, and rounding the col at La Vaurdette the Cabane du Col de Mille was in sight with low lights glowing away. I soon found out that the night plays tricks with distance perception, because the Cabane looked about 100 metres away, when it was in fact over 2 kilometres with some tricky terrain in between! The final run into the hut was however flat and less technical, much needed by then. The volunteers in this aid station seemed especially on the ball, I felt them look hard at me to see if I was going to survive, so I gave a cheery ‘bonsoir’ (It was now approaching midnight) and duly filled up my bottles. Down I went, initially well on the easier gradient, but more slowly where others seemed to just let it go on the steeper slopes in the middle. The bottom levelled out again and finally I was in Lourtier. The finish that followed was pure evil. Strava tells me that the next 4km averaged a 22% gradient, with sections much steeper than this. It took over 2 hours to ascend to the La Chaux ski station and now my heart rate was unable to go above 125bpm although perceived exertion was still high, perhaps this is normal in an ultra? By now my legs were however toast, and the descent was tricky in places, although mercifully I managed to get some speed up on a brief section of ‘Bisse’ trail, before plunging into the forest once more. The technical down eventually gave way to a dirt track, so on went the afterburners (well, that might be a bit strong, more like the lawnmower engine by then) and before I knew it I was at the Medran lift, crossing the bike park trails with the final sprint down the road into the centre of Verbier. Crossing the line was emotional, and fairly solitary, with the big crowds having stayed away for 3am in the morning, but hey ho, it was amazing to have pulled it off, and to have met the ‘gold’ goal I had set. I ended up 32nd overall, with 203 finishers and 270 dropping out at various points along the way. The aftermath was just a couple of hours kip before the kids woke me up, such is life these days, however my wife was spectacularly supportive in taking them out for the morning, and nursing me in general for the day. I was unprepared for the swelling in feet and ankles a day after finishing, but this didn’t last long, and at the time of writing 3 days after crossing the line, I’m feeling remarkable well recovered, although staying away from the trainers for a little while longer. I would like to thank the organisers, the amazing volunteers and all the runners around me for chats, smiles and ‘Bravos’. Most of all I thank my ever supportive family for their encouragement in all the training and during the event itself. The TVSB X-Alpine is a very special race indeed, and if you are seeking a big challenge in the Alps I can heartily recommend it. I had been using the Race Ultra 290s all year (more drop, cushioning and a slightly wider toe box in my opinion) but felt that the 270 might be the perfect ultra shoe for me. I was not disappointed, with it’s healthy toe box, good tread and 4mm drop leaving me supported enough, but also able to connect with the technical terrain in a way that the 290s lacked. I took these to shove in my drop bag, and I was not planning to use them as if anything the narrower toe box would be a problem with swollen feet. The river crossing and sweat however made a change essential, and I was pleasantly surprised by how good they felt for the final 35km. The extra toe protection might have saved my bacon at night as well as I stumbled a few times. I bought this watch for battery life and accuracy, and have been totally impressed with it over the past 6 months. I took a light and small charger to to put in the descent into Bourg St-Pierre, and it lasted a treat. The course was so well marked I had no need for the navigation, but it was nice to know it was there in case of a wrong turn in the dark. This seemed like a neat solution to carrying poles on long descents and flats, although to be honest holding them was not much trouble either. The pockets were useful for spare gels and a small first aid/blister kit. Overall this and the compressport number belt probably contributed to a little more chafe above the waist than I would have liked! Light, and easily collapsed to fit on the Archmax belt, and were essential kit. No issues whatsoever; I was careful to switch my grip around to avoid hand blisters. The ultimate sock! Enough said. Expensive, but gel pockets handy (my belts made these obsolete though!). The main thing is that these were totally chafe free and comfortable throughout- I didn’t change at my drop bag. Highly recommended. Tight, comfortable, and coped with the night/day temperature changes very well. I also used some old lycra arm warmers- superb for the nights. Worn to get around the full leg mandatory kit requirement, but very comfortable throughout. Did they help? Who knows, the jury is out on compression kit, they certainly didn’t hinder me! I was however left with a hilarious tanned stripe between short line and just below the knee. The new reactik+ looks like the perfect head torch for ultra running, but hadn’t come out when I bought the Nao. Never mind, although a bit heavier it has superb performance, with customisable profiles to balance brightness and burn time- I tweaked and played to get it perfect ahead of the race, with no need to use the spare batteries I took. Backup teeny tiny head torch, not used. Super light, good at absorbing sweat and kept me a it safer from the sun. It’s only problem was poor performance when turning it to facing backwards (I do this a lot on steep climbs). Used only during the final night as a headband above the ear, essential and versatile kit! About as essential as it gets. I had tried these in training to make sure they didn’t disagree with my stomach, and found them to be an amazing way to maintain some sort of electrolyte balance whilst sweating buckets and chugging litres of water from mountain streams. I took 1 every hour with food. Tried and tested over years of riding and running, no stomach issues. A good move. I made some bacon and egg rice cakes to offset the sweet bars and gels, and found this recipe as a free sample from the ‘feedzone’ book. They were excellent! Thanks to my colleague Ivor for the inspiration and taste tests.